Leaves flat with similar surfaces or terete and then entire or divided into segments or rarely trigonous. Conflorescences axillary, raceme-like with paired flowers or in several- to many-flowered clusters and then flowers not regularly or obviously paired. Flowers zygomorphic. Perianth tube revolute and curved under the limb; tepals splitting to base or remaining fused and splitting on upper side only. Anthers 4, sessile. Hypogynous glands fused, horseshoe-shaped, obovoid, or rarely disc-shaped, rarely absent. Ovary shortly stipitate, glabrous; style longer than the perianth, curved and protruding from a slit in the perianth before being released; pollen presenter an oblique or lateral disc or an erect cone. Follicle woody, surface smooth, wrinkled, blistered or warty, sometimes prominently beaked (apical portion of the fruit beyond the main swollen body of the fruit), often with apical horns (pair of hard points just behind fruit apex, often broken off in mature fruit); secondary thickening formed by the cambium, the fruit opening in 2 valves; seeds 2, compressed, testa expanded into a wing, usually at one end; seeds generally placed near the upper suture of the fruit and mostly borne in ± same direction as stalk of fruit. Distribution and occurrence: World: c. 150 spp., endemic Aust., all States. The fruit of Hakea remains closed on the plants for many years, with opening only occurring when the branches which support them die. During a fire seeds are protected by the woodiness of the fruit but the fruit opens soon after the death of the plant or branch. Thus fire may release a very large bank of seeds into the burnt area with most seeds germinating within a month. Some species also develop an underground swelling, commonly referred to as a lignotuber (e.g. H. bakeriana, H. laevipes, H. decurrens, sometimes in H. teretifolia and probably in H. eriantha), that enables the plant to resprout from the base following disturbance, such as fire. Those species which do not possess the lignotuber are killed by an intense fire. Because of these characteristics many Hakea species are favoured by fire. Some species grown overseas have become naturalized, probably because of their adaptability to fire, as well as the lack of predators. These include H. decurrens subsp. physocarpa in Spain and Portugal, and H. sericea in New Zealand and South Africa. Species of Hakea and Grevillea may be very similar, but they can be separated by the woody persistent fruit of Hakea versus the non-woody and non-persistent fruit of Grevillea. Other indicators are the upper and lower leaf surfaces being similar in Hakea but different in Grevillea and the ovary and style in Hakea are always glabrous and so any hairiness on either would indicate a Grevillea species. Flowering and fruiting rachis >2 cm long; follicles many per rachis; trees or shrubs with corky bark; flowers yellowish to whitish. Perianth in mature bud >5 mm long; gynoecium >18 mm long, style recurved, at least initially, pollen presenter an oblique disc; follicles glabrous. Leaf segments divergent, ± rigid, 2–15. Shrub or tree, forming fruits; branchlets ash-white pubescent; raceme 5–16 cm long; leaf segments 4–15; extreme NW corner of State. Pollen presenter oblique or lateral; follicles horned or not; leaf venation obvious or obscure; perianth pubescent or glabrous. 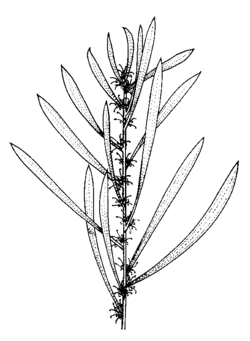 Leaves 1.5–4 mm wide; longitudinal veins 1–3; coastal heaths south from Eden. Plants lignotuberous, resprouting after fire; branchlets with persistent dark brown hairs, tomentose or pubescent. Pedicel and perianth glabrous; pollen presenter an oblique disc; follicles horned or not horned. Leaves sometimes a mixture of terete and flat, <3.5 mm wide; follicles 6–8 mm wide, ± smooth. Follicles 6–12 mm wide, covered with with raised black blisters, rarely with rounded warts <0.5 mm high; gynoecium 7–10 mm long; rachises often more than 1 per axil. Branchlets and leaves pubescent or glabrous, but not villous; follicle with seed in same line as stalk or somewhat oblique. Flowers larger, perianth >2.5 mm long; gynoecium 4–40 mm long; pedicels glabrous or pubescent. Compact or spreading shrub or small tree 0.5–4.5 m high; follicles 2.5–3.5 cm long. Flowers white, pink in bud; perianth 2.5–4.5 mm long; coastal regions and adjacent ranges, south from Coffs Harbour. Flowers white; follicles <3 cm long. Perianth c. 10 mm long; gynoecium 29–32 mm long; follicles 3–4 cm long, c. 1.5 cm wide smooth or roughened but not densely and deeply wrinkled; hilly sites north of Yetman. Follicles c. 25 mm long, not recurving on opening, obscurely or not horned; seed filling only part of valve; leaves all terete; drier western regions. Leaves spreading, 1.3–8 cm long; rachis with mixed white and rust-brown hairs; pedicels villous, tomentose or with appressed hairs; seed wing dark-coloured; widespread species. Gynoecium 4–7.5 mm long; perianth 2.5–4.7 mm long; pedicels villous, hairs white; branchlets persistently woolly tomentose. Follicles with beak apical, ± equally represented on both sides of follicle; rachis white tomentose, or if some rust-brown hairs present, the rachis more than 3 mm long; gynoecium 7–12 mm long; in southern and western parts of teh State. Young growth not with shining white pubescence; follicles ± smooth; rachis 6–14 mm long, white tomentose or with appressed white and rust-coloured hairs; drier western regions. Mature follicles 2.3–2.7 cm long, 1.7–2 cm wide, coarsely wrinkled or blistered; subalpine areas south from the A.C.T. Conflorescence not elongated, rachis 0–3 mm long; follicles usually one per conflorescence, smooth or variously warted; shrubs or trees, leaves not drooping, 1.5–15 cm long. Conflorescences 5–25 cm long; leaves ± rigid, mostly 15–68 cm long and 0.9–2.5 mm diam. ; valves of fruit moslty 13–20 mm wide; confined to the Collarenabri district. Leaves not grooved; perianth with sparser hairs than pedicel, usually quickly glabrescent. Pedicel and perianth with moderately densely white raised hairs, sometimes denser on perianth; follicles obscurely horned, beak to 10 mm long; north from Torrington area. Conifer-like tree or shrub; follicles 40–55 mm long, 30–40 mm wide; rocky outcrops in Blue Mts, rare. Mucro of leaf bent; follicles ovoid, 15–20 mm wide, with ± rounded apex, lacking a fringe in lower half; drier western regions, from Slopes to plains.